Mumbai/Bangalore: Nearly three decades after Sudha N. Murty pledged her jewellery for Rs10,000 to part-fund N.R. Narayana Murthy and his six colleagues to start the company that would eventually become Infosys Technologies Ltd, she has sold around one-fifth of her shares in the company to fund her husband’s new venture, Catamaran Investments Pvt. 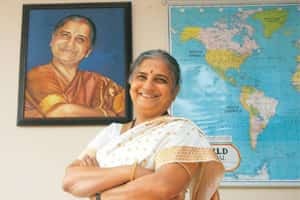 Ltd.
On Thursday, Sudha Murty sold two million shares or 22% of her holding in Infosys to raise Rs430 crore. On 22 October, Narayana Murthy sold one-fourth of his holding in the company to raise Rs174.3 crore as seed money for his venture capital firm that will “encourage and support young entrepreneurs having brilliant ideas". At the time of the first sale, Murthy had hinted that he was willing to sell more Infosys shares to fund his new venture. The fund will primarily focus on early stage companies in India, Murthy had said at the time of his share sale. With the fund size growing to Rs604.3 crore, Sudha Murty and Narayana Murthy do not have immediate plans for raising additional capital, Infosys said in a statement. Sudha Murty, who holds a master’s degree engineering from the Indian Institute of Science, and one of the three trustees of Infosys Foundation, the company’s corporate social responsibility arm, sold the shares at a discount to Thursday’s market price. In a single block deal, transacted at a 3.2% discount to Thursday’s close, Sudha Murty sold the shares at Rs2,151.80 each on the Bombay Stock Exchange. On Thursday, shares of Infosys fell 0.74% to close at Rs2,223 each, with an intra-day high and low of Rs2,156 and Rs2,235, respectively. On Thursday, even as one promoter diluted holdings, the company’s chief executive and co-founder S. Gopalakrishnan acquired 400,000 shares in a separate transaction for Rs86.6 crore, Infosys said in a statement. With Thursday’s purchase, Gopalakrishnan’s total holding in the company has gone up to 6.7 million shares, perhaps a signal to the market of the chief executive officer’s confidence in his company. Together with their son Rohan Murty and daughter Akshata Murty, the Murthys hold nearly a 5% stake in Infosys. Narayana Murthy isn’t the first Infosys founder to venture into the venture capital business. In 2000, N.S. Raghavan, one of the seven co-founders and former joint managing director of Infosys, retired from the company to start Nadathur Holdings and Investments Pvt. Ltd. That firm has investments in several companies. Azim Premji, chairman of Wipro Ltd and one of Murthy’s peers, owns a similar fund with a corpus of $1 billion (Rs4,710 crore). The stock markets were indifferent to the latest transaction made by Infosys’ first family. Anand Tandon, director, equities, Brics Securities, said: “Clearly, every man reaches a stage in life when most of needs are met…and what is the point in keeping most of his wealth locked in stocks of a mature company, when he can use it to nurture start-ups. Clearly, the best growth days of Infosys are behind it. It is a more mature company and though it may still double in size from here, it may not happen at the same pace as in the past."